The city of Guangzhou is the provincial capital of the Guangdong Province of China, home to a population of over 6 million people. There are many bus companies based in the city running a vast variety of buses mostly built within China. 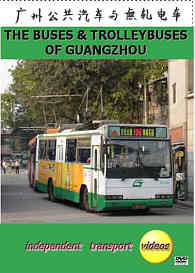 The bus companies are referred to as the ‘Guangzhou No.1 Bus Company’, ‘Guangzhou No.2 Bus Company’, ‘Guangzhou No. 3 Bus Company’ and the ‘Guangzhou Trolleybus Company’. More companies have recently started up. Hong Kong’s New World First Bus also have a presence in the city and have as recently as December 2006 bought a share in the No.2 company. There is the familiar livery of Macau’s TRANSMAC fleet as they also have a company here. Most of the buses are built by the Guangzhou Bus Factory, although the older trolleybuses are built by the Shanghai Bus Manufacturing Co.
independent transport videos made a visit to the city in November 2006 to film the smartly turned out buses and trolleybuses in action and to capture the excitement of this vibrant city that still has many sights from a bygone era mixing in with the twenty first century. Most of the filming is done in the busy city centre where new and older vehicles are seen dodging other traffic and pedestrians! We visit a busy trolleybus station to see these silent vehicles going about their daily duties. We witness a recovery operation where a retired Guangzhou city bus attends a breakdown. There is evening rush hour footage as well as plenty of action on the busy streets of this fascinating Chinese city.